This is a sample acrylic fiber from the sample-set provided by Textile Fabric Consultants, Inc. Acrylian is a trademarked product of the Monsanto Chemical Company. The low birefringence and small diameter of the fiber results in the first order white interference color seen here. Acrylian has a relatively high birefringence for a acrylic fiber, near -0.012, and a cross-section slightly bean shaped. 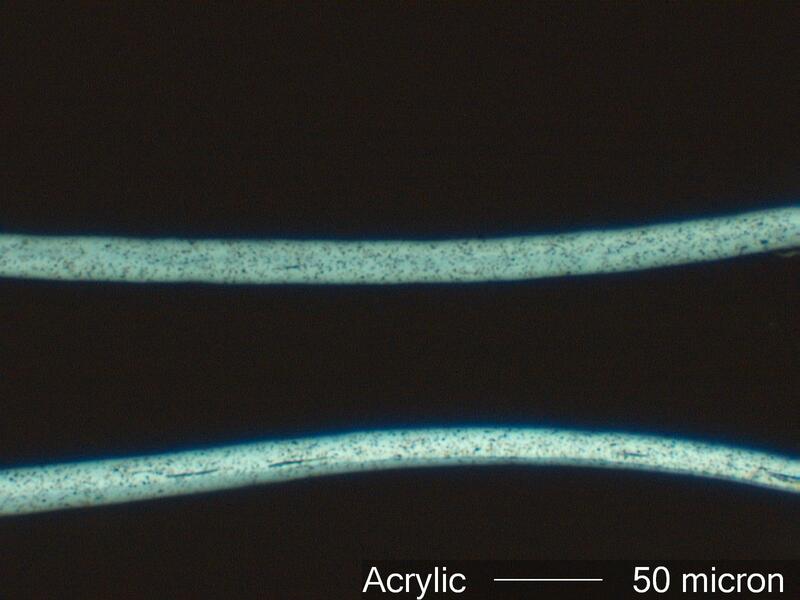 Rutile in the fiber appears as black specs. Rutile increases light scatter in the fiber and makes the fiber appear brighter though it "dulls" the specular reflection. Fiber with rutile is referred to as "dull". Acrylic fiber is derived from petrolium products. It is formed by drawing the polymer in solution through a spinneret into a bath where it solidifies from the outside in. This results in less than a circular cross-section because the outside polymerizes first and is drawn more rapidly though the bath than the interior of the fiber that is still liquid. The draw-rate and process affects the fiber diameter, birefringence, and the cross-sectional shape, from nearly round, to bean shaped, to dog-bone, to slightly crinulate. Acrylic fiber was commertially producted starting in about 1944. Acrylic fiber has a refractive index along its length of about 1.50 to 1.53 and perpendicular to its length of about 1.50 to 1.53. It has a birefringence of about 0.002 to 0.012 and a negative sign of elongation. It may exhibit slight irregular striations along its length due to the crinulate cross-section of the fiber, one depression along its length in the case of the dog-bone cross-section, or appear to vary in diameter due to a bean shaped cross-section.